As detailed in an earlier blog, one of the collections that is being digitised and catalogued thanks to our Heritage Lottery funding is the personal collection of a family who used to live in Huyton and was deposited by a member of the family who had been born in 1914, shortly before the outbreak of war. Luckily for us, she was an habitual hoarder – keeping correspondence between herself, family members and friends, as well as various other family-related items. Included amongst the family’s business and personal documents are some fantastic postcards sent and received from the First World War through to the Second World War. My earlier post on this collection described how powerful and insightful these are and how they provide a fascinating glimpse into the relationships family members had with each other and their wider friendship and community networks. The combination of image and words that postcards bring together has a wonderful way of evoking voices, allowing us a rare opportunity to listen to the past. Now that the digitisation and cataloguing of the postcards have been completed, we decided to put up a small display of duplicates, with labels providing interesting contextual information. Four of the postcards are part of a chain between a father who was serving in the Royal Flying Corps during the First World War and his young daughter (whose personal collection all of the items in the display come from). 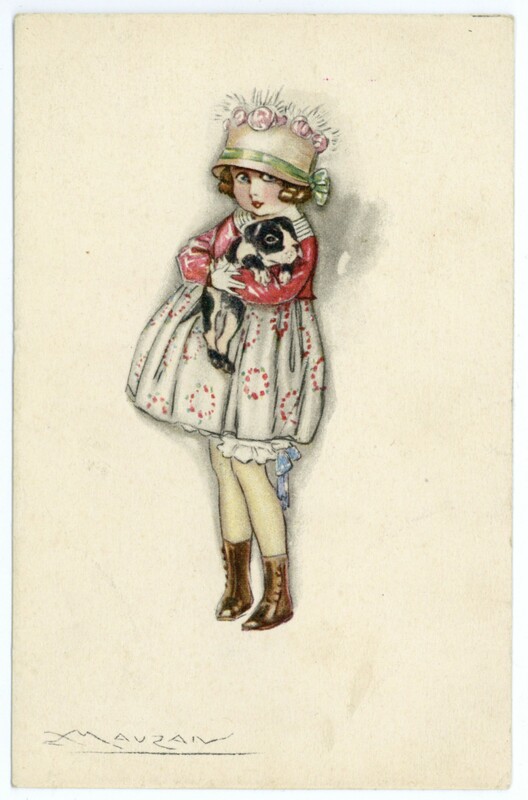 As described in an earlier post (‘Postcards from the Past’), the pair used to enjoy trying to outdo each other with cards that made them laugh or they found particularly cute – usually meaning pictures of little girls or sweet animals or, even more ideal, animals and children together! Also from the First World War period, we have two cards that portray the devastation wrought by battle in Europe. 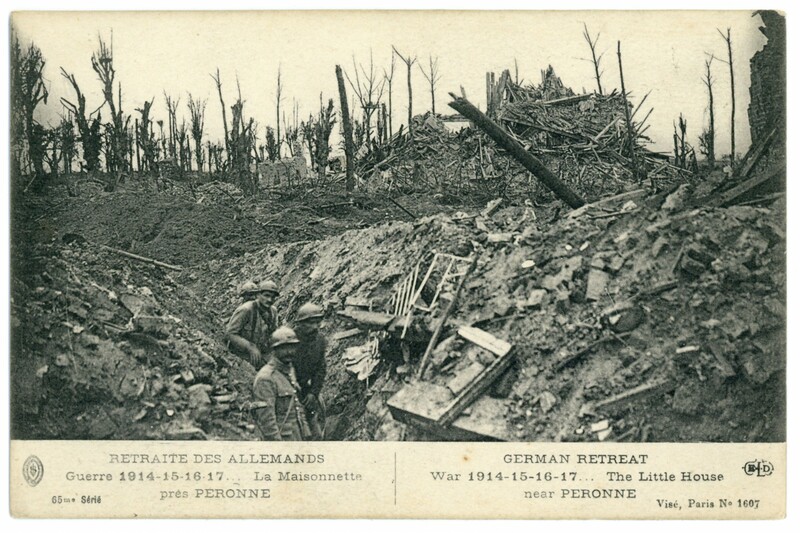 Postcards with images of bombed ruins in France were popular towards the end of the First World War with British soldiers sending word home or to be purchased as a souvenir of the war. The postcard of Peronne we have selected (below, top) is one of several in this collection that was not sent to anyone, but brought back to England as, presumably, a memento. 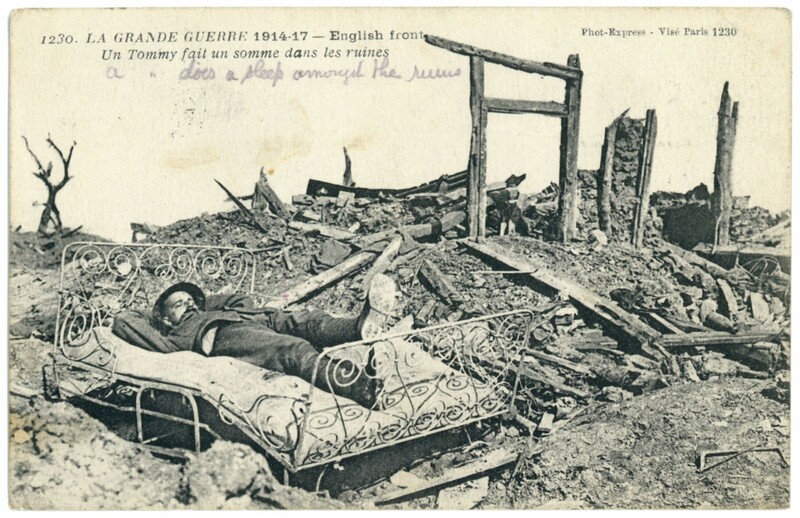 As ever, humorous cards were very popular to send home and our other card of war damage (below, bottom) provides a brilliantly incongruous image of a British soldier taking a nap on a bed amongst the ruins. The postcards we have selected from the inter-war years reflect the social life of our depositor as she became a young woman who was lucky enough to travel across the country and visit parts of mainland Europe. 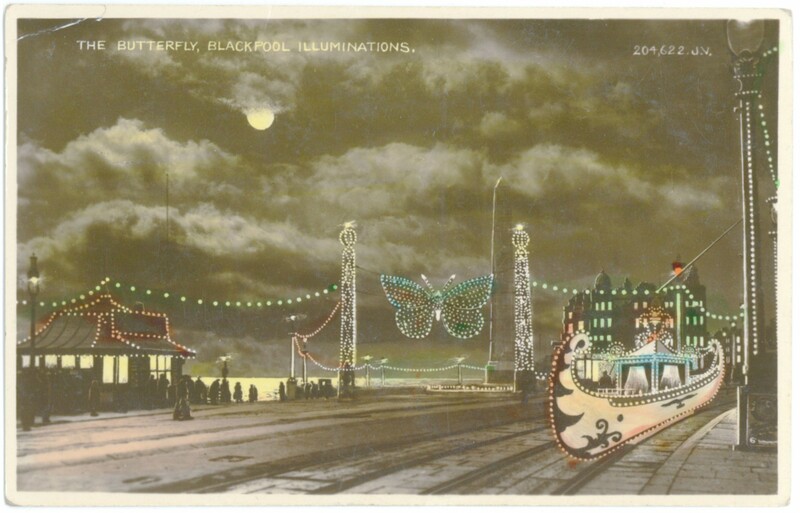 From 1928, her elder sister, sends a beautiful image of the Blackpool Illuminations back home to her then-teenage sister, a reminder of both the long history of the Illuminations and the popularity of Blackpool as a short break destination for residents of Merseyside and the surrounding areas. Our young woman’s correspondents during the 1930s include a German man who would send her postcards in English, French and German. Amongst these are two postcards of great historical significance. 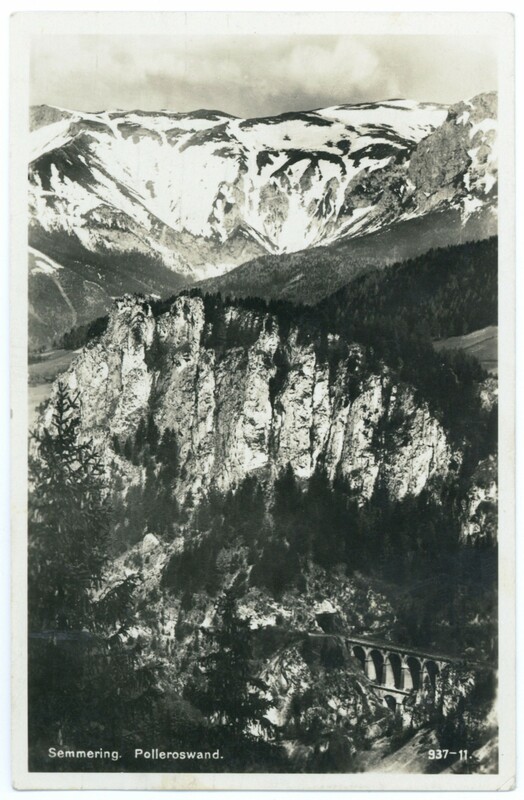 The first (below, top), from April 1938 and written in English with an image of Semmering, Austria, was sent from Vienna, Austria, shortly after Adolf Hitler had annexed the country and paraded triumphantly through the city. The sender uses apostrophes when writing how ‘happy’ his friends are to see Hitler there, possibly indicating that they were exactly the opposite. 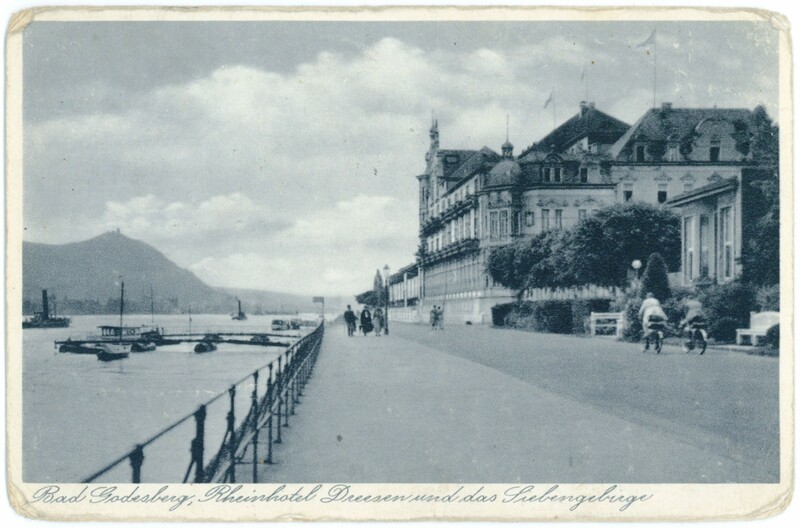 The second (below, bottom) has an image of the Rheinhotel Dreesen in Bad Godesberg, Germany, and was sent on 22nd September 1938. The German text contains references to Hitler and the British Prime Minister, Neville Chamberlain, as it was written and sent whilst historic meetings were taking place at the hotel between the pair that would, with hindsight, bring the Second World War one step closer. The mini-exhibition of postcards can be viewed at Kirkby Library, Mondays, Tuesdays and Fridays: 10am – 5pm; Thursdays and Saturdays: 10am – 1pm. For any more information about the collection or to view the originals, please contact Knowsley Archives.